Sometime back, hubby had to travel aboard for a week and then the trip extended by another 10 days. And it was around this time, that kiddo wanted the toy Bay Blade really bad. He tried every trick on the book and still I didn’t relent. And like magic, kiddo opened his eyes. And me and my husband started laughing. Kiddo sure got his priorities right :))! And me too, infact. Because soon, I was digging in the suitcase for the packet of yeast I had asked him to buy for me. And thanks to that packet of yeast, I am trying my hands at bread baking again. And this time, with good results! 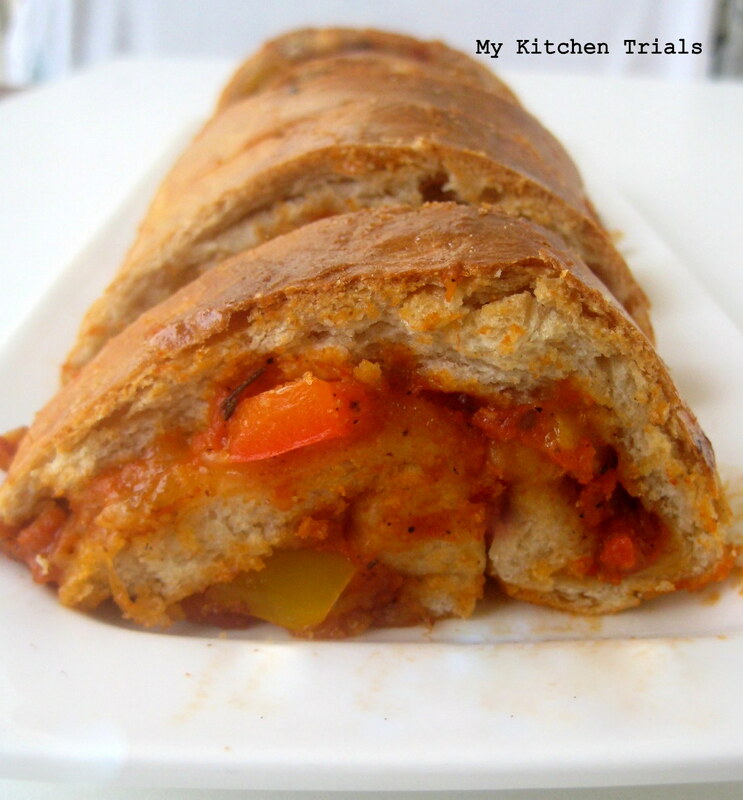 For the third week of Blogging Marathon 21, I chose the theme Sandwiches, rolls or wraps. 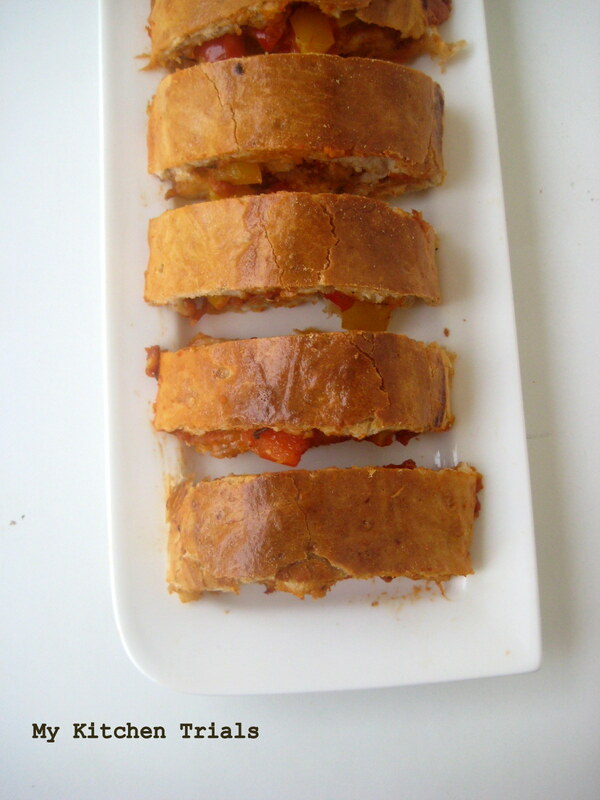 Starting off with an Italian style pizza sandwich. Check out the Blogging Marathon page for recipes from fellow bloggers. For the topping, cube the vegetables and keep aside. You can add frozen spinach, corn, mushrooms, the choices are unlimited. You can saute the vegetables and season them or use them just like that. Its your preference. I use Amul Pizza Mozerella cheese. And I pulse it in the mixie for 30 seconds to shred it for easy use. 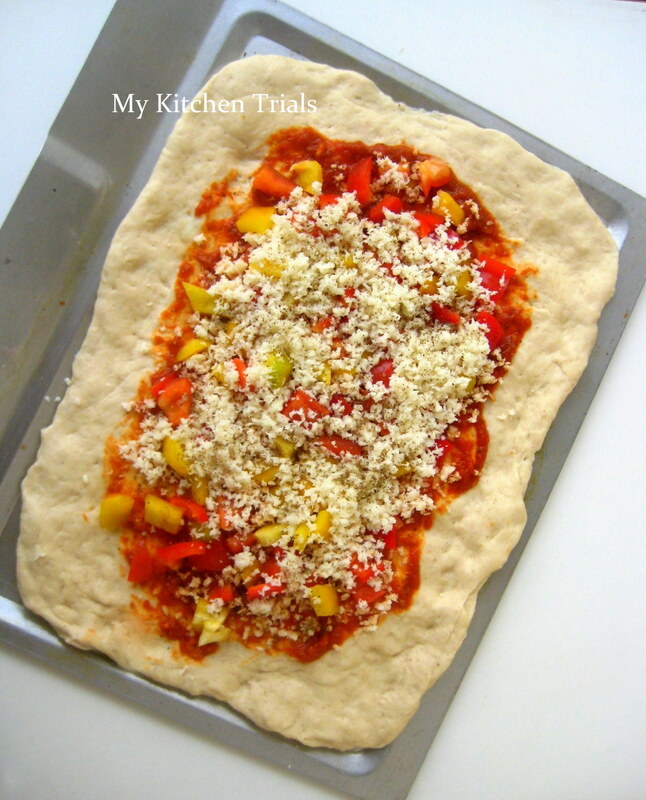 Spread the dough into a rectangle in a parchment sheet. I did this directly into the biggest oven tray I had, and it left oil stains while baking. So do this step in a parchment paper. You will also have to take care not to roll it too thin as the filling might leak out (as it did for me :D) if the dough breaks. Spread the pizza sauce of your choice. Leave about an inch from all the sides. Add the topping, and season with salt & pepper. Add the cheese and fold the edges. Now roll it, taking care that the filling doesn’t spill out. Once rolled, you can do an egg or milk wash if you want a nice brown top for the roll. Bake for 20 minutes or until the top is brown and looks done. Take out of the oven, wait for 10 minutes for the bread to cool down, slice and serve with a dip or ketchup. 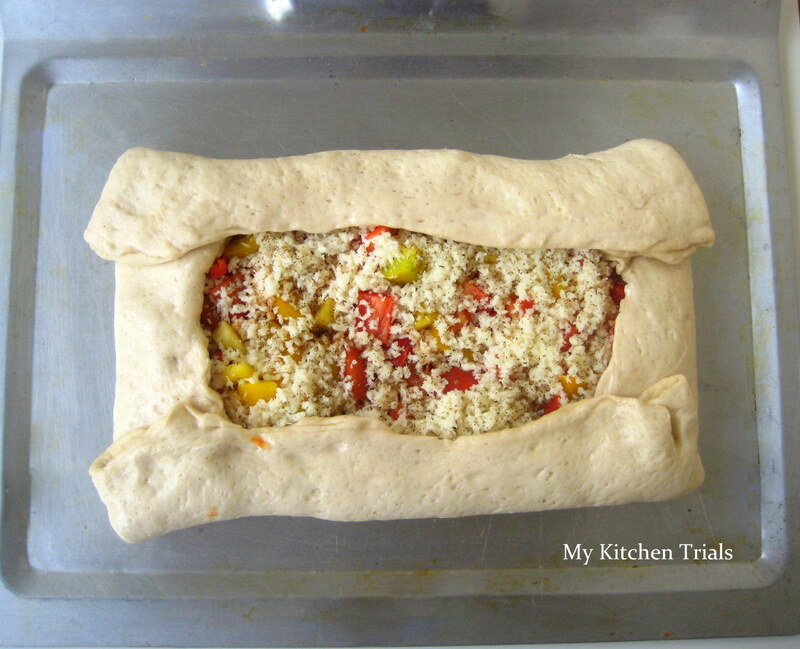 your stromboli looks amazing – although this is sold at every pizza shop in NYC, I’ve actually never had it – I must try…glad your bread baking has been successful! oh my!..this looks stunning…surely would try ..may be along with Mireille in NY! !..ah these little kiddos, Bless them they dont believe in specific words, they speak from their heats…. 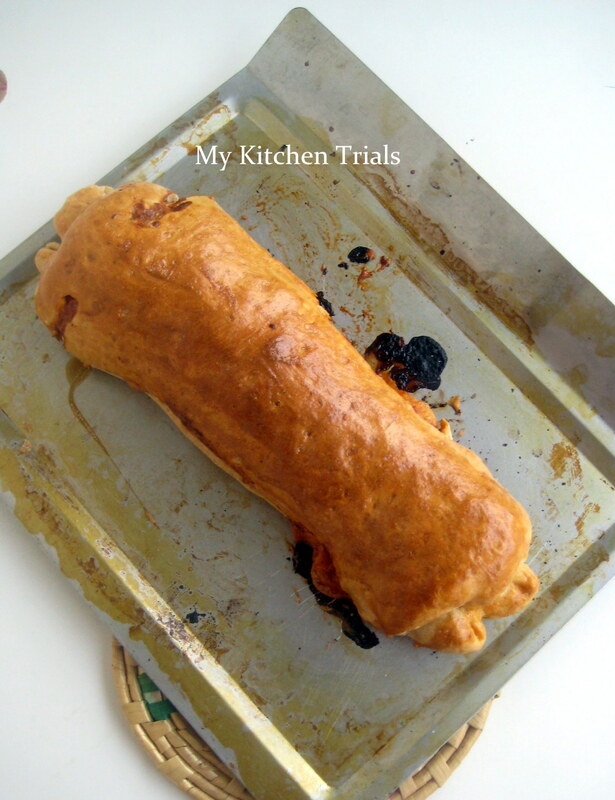 Yippeee ….welcome to the wonderful world of baking with yeast. Your little one must have inherited his perseverance from you. The stromboli looks awesome. Wish I can have a bite. The pictures speak for themselves. It is sure to be a hit with family and friends. Absolute adore the kiddo’s reaction too.